In 1997, a mysterious space mission bewildered observers of the Russian space program. On June 6, at 19:57 Moscow Time, a Proton rocket, the most powerful space booster in the active Russian fleet, lifted a classified cargo into orbit. Official Russian sources identified the newly launched satellite as Kosmos-2344 and announced that it would be used for the purposes of the Ministry of Defense. For most classified space missions such a statement would conclude the official "coverage." However, in the case of Kosmos-2344, a string of revelations followed as the cash-starved industry tried to walk a fine line between the secrecy of military space technology and the efforts to use it for civilian purposes. On the day of the launch, the independent Moscow newspaper Kommersant Daily ran a story about Kosmos-2344, disclosing its internal "industry" name -- 11F664. Quoting sources in the Russian Duma (parliament), the paper described the financial problems and delays that had beleaguered the development and launch of the satellite. Russia's Chief Reconnaissance Directorate, GRU, was reportedly not even ready to utilize the data from the new spacecraft, whose development had started back in 1984. 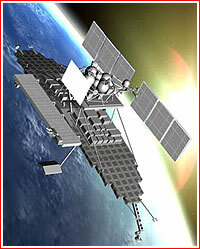 According to the Kommersant, Kosmos-2344 was a new-generation reconnaissance satellite capable of transmitting surveillance data in real time. 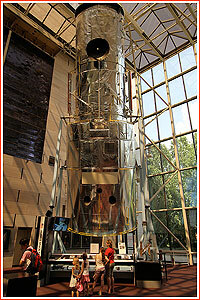 However, independent analysts expressed doubts about the spacecraft's usefulness for optical reconnaissance. Given the known orbital parameters of the satellite -- 1,516 kilometers in perigee and 2,749 kilometers in apogee -- much higher then the typical orbital altitude used by "traditional" spy satellites -- Kosmos-2344 was thought to be able to provide only low-resolution photography. As it turned out, Russian developers had been far ahead of their time. Surprisingly, only after the Gulf War of 1991, did US military strategists apparently conclude that a very high orbit would enable a spy satellite with powerful lenses to watch areas of interest for long periods of time and thus have an advantage over traditional imaging spacecraft that can spend only few moments at a time over their target. Western sources speculated that the mysterious Russian satellite carried a 6.89-meter-tall optical system with a reflective mirror, resembling an astronomical telescope design known as Cassegrain. The spacecraft could reportedly photograph its targets not only directly below its flight path, but up to an angle of 45 degrees toward the surface of the Earth, capturing areas 1,800 by 3,000 kilometers. Observers of the Russian space program soon discovered that in October 1994, Russian defense avionics developer NPO Elas and the industrial optics firm NPTs Opteks, based in Zelenograd, had presented a paper at the International Conference on Satellite Communications, ICSC, in Moscow about the Arkon-1 spacecraft. According to the document, a satellite intended for imaging of the Earth surface would be circling the Earth at a 2,800 by 1,500-kilometer orbit with an inclination 63 degrees toward the Equator. Almost three years later, the unusual orbital parameters quoted in the paper turned out to be very close to those of Kosmos-2344. The paper also claimed that the satellite would have a resolution of 2-5 meters, thanks to its reflecting telescope with a focus length of 27 meters. 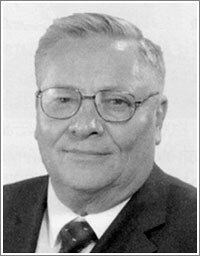 Most surprisingly, it was the prime developer of Kosmos-2344, NPO Lavochkin, who provided the most information about a supposedly top-secret mission. In several of its publications preceeding and following the launch of Kosmos-2344, the company released drawings, and even photos, of a partially obscured spacecraft identified as Arkon! According to NPO Lavochkin's official history published in 1997 (118), the project, which led to Kosmos-2344, started in mid-1980s with the development of a multi-mission platform "based on the Arkon satellite." The original secret mission of the spacecraft was not described in this source; instead, NPO Lavochkin listed Arkon among the platforms available for commercial applications. The company specified that the Arkon-based spacecraft would be capable of carrying astronomy and remote-sensing payloads. 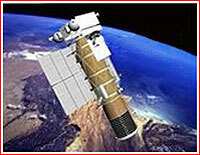 Clearly, developers of the satellite looked at the possibility of commercializing a classified military project. In the following years, there were also reports that in order to keep the program afloat, the Russian government was prepared to sell imagery from its most advanced imaging satellite via the state-owned Rosoboronexport company to such countries as Syria, Iran or North Korea. Kosmos-2344 was also "matched" to yet another previously known design. As soon as NPO Lavochkin revealed the general appearance of the Arkon platform in 1997, independent analysts recognized the satellite's long-known civilian cousin -- the Lomonosov astronomy telescope. (117) NPO Lavochkin apparently started working on the Lomonosov project as early as the end of the 1970s and a decade later, the Sternfeld Astronomy Institute reported plans to use the spacecraft for high-accuracy cataloging of astronomical objects, similar to the mission of the European Hipparcus satellite. However the Lomonosov project never left the drawing board. According to official specifications released by NPO Lavochkin, the Arkon-1 spacecraft carried panchromatic and near-infrared sensors. The use of infrared sensors, requiring low temperatures to operate, explained the presence of a large cooling array on the side of the spacecraft. Beginning with the third mission of Arkon, NPO Lavochkin promised to introduce a more versatile version of the satellite, featuring additional optical and infrared sensitivity. NPO Lavochkin specified that the Arkon's unusually high orbit allows the satellite to scan wide areas on the surface of the Earth and to cover the same regions during different orbital passes, as well as to look at the same targets from different angles. The Arkon's high orbit also allowed the craft to "watch" the same target during dozens of minutes on each pass, instead of shorter periods of time for traditional spy satellites. NPO Lavochkin also confirmed that the Arkon was capable of transmitting digital data in real time or storing information onboard for later downlinks. Even though NPO Lavochkin identified Kosmos-2344 as the Arkon, it was apparently the "marketing" name of the platform, which was applied to a "civilian" or "dual-purpose" incarnation of the classified military spacecraft. In 2001, Russia's space forces published the latest chapter of their official history, (119) which confirmed earlier reports (117) that the real name of the military spacecraft launched in June 1997 had been Araks -- after a river in Caucasus. (Ironically, after the dissolution of the Soviet Union, the Araks River ended up flowing outside of the Russian borders.) The source identified the June 1997 mission, as the first flight test of an upcoming constellation of satellites, which was to include Araks-N and Araks-R versions of the spacecraft. During the 2000s and 2010s, multiple Russian sources added many more details on the Araks project. 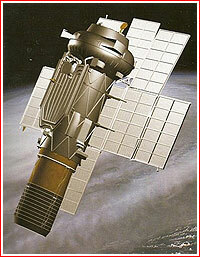 As it transpired, the spacecraft was conceived to replace the Yantar (a.k.a. 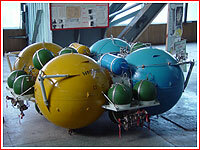 Neman) series of reconnaissance satellites. A total of three Araks-N satellites were expected to operate simultaneously in a "low" orbit with an apogee of around 4,000 kilometers, providing near real-time global imagery of the Earth surface. The 7.5-ton Araks-N satellites were designed to work in tandem with 14-ton Sapfir-V satellites developed by TsSKB Progress and designed to climb as high as 10,000 - 20,000 kilometers to obtain imagery of very wide areas, but at lower resolution. In the designation Araks-N, "N" stood for "nizko-orbitalny" or low orbital in Russian, while "V" in Sapfir-V meant "vysoko–orbitalny" or high-orbital. The very high elliptical orbits intended for Sapfir-V's orbits would let it stay within view of an area of interest up to 20 minutes at a time transmitting live imagery, as it climbed toward and descended from the high point of its orbit, followed by a quick swing around the low point of its orbit positioned on the opposite side of the globe. Military planners expected Sapfir-V to focus on the European region watching the main Cold War frontier between the West and the East. NPO Lavochkin apparently proposed its own version of a high-orbital reconnaissance satellite designated Araks-V, which has never been built. The Araks and Sapfir projects were proposed by NPO Lavochkin and TsSKB Progress in 1977 and 1979 respectively, however their implementation was hampered by the reluctant attitude of the Ministry of Defense Industry and the lack of production and test capabilities in the country. Only in 1983, were both projects approved for development. At the time, the launch of Sapfir was scheduled for 1986, while Araks would fly in 1987. A drawback of Araks-N and Sapfir-V projects was the need for a really powerful, large-diameter telescope to compensate for the much higher orbit than that flown by traditional low-orbiting spy satellites. Not surprisingly, telescope development became a stumbling block of the project. The Araks-N satellite was to carry an optical telescope designated 17V317 and sporting the largest space-based mirror developed in the USSR. This optical system was developed by a collective of engineers under leadership of Alim Velikozhon at the LOMO company in St. Petersburg. The diameter of the main mirror of the telescope measured 1.5 meters. A similar telescope designated 17V321 was to be installed on the Sapfir spacecraft. Depending on the altitude, the resolution of these devices could vary from 30 centimeters to 1-2 meters. In 2001, RKK Energia disclosed that to launch the almost seven-ton Araks 11F664 satellite on June 6, 1997, the company had upgraded its Block-D upper stage and given it a new designation -- 17S40. Serving as the fourth stage of the Proton rocket, the 17S40 No. 1L stage was equipped with a strengthened transfer truss, probably in order to carry a considerably heavier payload than Block-D's traditional passengers. According to RKK Energia, the payload was released into a 2,750 by 1,500-kilometer orbit. (164) Apparently, to support the Araks program, the Kurier (Courier) upper stage was proposed around 1998. As it transpired half a decade later, one of two rechargeable power batteries onboard the first Araks satellite failed immediately after the separation from the launch vehicle on June 6, 1997. According to another source, one out of three channels in the onboard flight control computer also failed. The battery failure led to problems during the operation of the spacecraft in the shadow of the Earth. It required that ground controllers continuously sent commands to turn on and off various heaters in the onboard thermal control system, in order to preserve limited power. In order to get some flexibility in heating various systems, mission control also disabled an onboard diagnostics algorithm, which had been programmed to turn off heaters when low voltage had been detected. 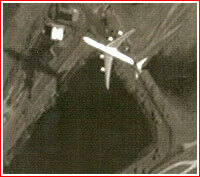 The problem was reportedly fixable, probably with a patch in the flight control software. However, mission control was apparently too busy handling data from the spacecraft and preparing for the formal transfer of the mission to an operational status. In October, a controller reportedly forgot to send a command to turn off some of the onboard heaters as the satellite was entering prolonged periods in the shadow of the Earth. It led to an almost complete depletion of surviving power batteries during a pass on the night side of the Earth. As the satellite emerged into the daylight and established contact with the ground, mission control attempted to orient its solar panels toward the Sun and to recharge its batteries. However before Araks could complete the command, "lights went out" onboard, cutting the mission short four months after the launch instead of the minimum two years it was suppose to work. Despite the very early failure of the mission, many operational modes of the spacecraft were tested during the flight, giving a wealth of experience for the preparation of the next mission. A total of 55 usable images were received. The second Araks satellite was apparently expected to fly within a year, however with all the economic turmoil in Russia at the time, it would not reach the launch pad for five years. On July 25, 2002, at 19:13 Moscow Time, a Proton rocket lifted off from Site 81 in Baikonur Cosmodrome. The launch vehicle carried a classified satellite officially announced as Kosmos-2392. The spacecraft separated from the upper stage at 21:27 Moscow Time, after reaching a highly elliptical orbit around the Earth. From statements made by Russian space officials, it became clear that another Araks satellite had finally made it into space. The mission lifted off years behind schedule, which was evidenced by the fact that the technical warranty for the Block-D upper stage used in the mission had expired on March 28, 1998, requiring many additional checks before it was cleared for flight more than four years later. Following the launch, some Russian publications mistakenly put the mass of the satellite at 2.6 tons, leading to claims in the West that the second Araks was a much smaller version of the spacecraft. Projected to work for at least four years, the second Araks started its mission very successfully. Veterans of the project later remembered that the capabilities of the satellite had exceeded the expectations of the Russian military. In fact, ground control was not able to keep up with all the high-quality imagery coming from the spacecraft. Still, a power surge in the electric system caused by either static discharge or by a solar flare disabled one of the telemetry units and a heating system on the star tracker unit. The telemetry transmission was switched to a backup device, however there was no replacement for the heater. As a result, star trackers quickly cooled off far below acceptable level. One tracker failed completely, one worked half the time, yet, one remained operational, apparently salvaging the mission. On August 10, 2003, more than a year after launch, Araks reentered the range of Russian ground stations following an eight-hour period without communications during the night from August 9. That's when mission control discovered that the service module onboard the satellite had depressurized. According to analysis, all pressurization gas was lost in several minutes, as the spacecraft was crossing the Pacific Ocean on its way toward California. Not surprisingly, it led some to speculate that the US might have played a role. However, the majority of experts blamed space junk hitting the vehicle. Multiple Musson and Gonets satellites, along with third stages of their Tsyklon-3 rockets and their detachable attachment mechanisms were found circling the Earth at an altitude of 1,500 kilometers. Obviously, a hermetically sealed container could lose pressure by itself, possibly, at one of its weak points, such as seals, resin insulators or entrances of cooling lines into the pressurized compartment. Finally, meteors could deal a fatal blow. For almost a month after the incident, ground controllers managed to communicate with the satellite, however they never established the exact cause of the failure. The second Araks thus fell far short of its projected four-year lifespan. By the time Araks-2 reached orbit in 2002, NPO Lavochkin's development team already knew that the third satellite in the series would never fly. Two years earlier, the company's bid to develop a next-generation reconnaissance spacecraft had lost to a proposal from TsSKB Progress in Samara to build the Persona spacecraft. Yet, despite considerable expense for Persona, by 2002 problems with the project had already pushed its launch date to 2006 at the earliest. In response, in 2003, NPO Lavochkin issued an engineering proposal to build the third Araks (No. 6422) satellite from already existing hardware. The service module would be borrowed from a thermal testing prototype, other hardware and the telescope payload would come from a technical prototype of the spacecraft. Available spare parts from the second satellite would also be recycled for the third mission. Still, several missing components had to be ordered from sub-contractors. For example, more advanced star trackers could be purchased from a newly established development team led by G. A. Avanesov at Space Research Institute, IKI, in Moscow. Their use would require to upgrade software in the attitude control computer. In addition, the obsolete optical-electronic processing system for storing and transmitting images in the original Araks satellite could no longer be manufactured and had to be developed from scratch. One of the proposed solutions called for borrowing a backup system from the Resurs-DK project. To increase the resolution capabilities of Araks-3, it would be launched into a lower orbit than that of its predecessors. Due to the lower altitude, the Block D upper stage could be replaced with Fregat mounted on a Proton or Zenit rocket. Building the third Araks would require three years and 570 million rubles, not counting the cost of the launch vehicle. NPO Lavochkin hoped to fund Araks-3 from the already approved budget of the stalled Persona project, presenting it as the first phase of the program. The Russian space agency and the Ministry of Defense growing increasingly skeptical about TsSKB's ability to complete Persona tended to listen. Naturally, TsSKB Progress staunchly opposed the move. In 2004-2005, as the Persona project continued struggling with delays and cost overruns, NPO Lavochkin allied with RKK Energia to propose the Russian space agency the Arkon-Viktoria project based on their own hardware. 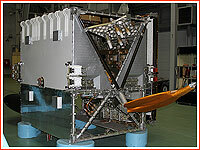 RKK Energia would contribute the Viktoria service module, whose prototype had served as a foundation of the already flying Yamal satellite. In turn, NPO Lavochkin would supply an imaging system derived from the Araks program. Although it was technically a civilian project, specifications for the future satellite were coordinated with the Ministry of Defense. In the absence of federal funding, the agency and the industry hoped to attract private investment into the Arkon-Viktoria project. However all these efforts were to no avail, as the Russian space agency and the Ministry of Defense were not ready to guarantee a return on investment for any private participants. In the wake of the post-Soviet economic problems, only two Araks-N satellites would be built and launched in lower than designed orbits in 1997 and 2002, before the parallel development of Sapfir-V had stalled after a huge expenditure of time and money. The Araks project ended up to being very pricey and complex yet it was unmatched in its crucial capabilities, such as image delivery rates and image resolution. According to some sources, NPO Lavochkin built as much as 90 percent of a follow-on Araks-R satellite, however it never flew, as the company struggled with the lack of funding and the loss of qualified personnel. Still, the hardware and experience from the Sapfir and Araks projects was inherited by the Persona and Elektro-L satellites during the 2000s. In 2012, Russian sources revealed that Roskosmos had initiated a tender for a research and development program, OKR, under the code name Araks-R. Apparently, a 20.8-billion-ruble loan guarantee was issued for the project, with 678 million rubles allocated for the first phase of the work covered by the tender concluding on December 4, 2012. A total price tag for the project was reported to be 70 billion rubles. TsSKB Progress in Samara reportedly submitted a bid, probably along with NPO Lavochkin and RKK Energia. Judging by the modest amount of funding, it could be concluded that the project was in embryonic state and likely had no commonality in design and scale with the original Araks satellite. According to several unofficial reports, NPO Lavochkin in tandem with the European company Thales Alenia Space won a Russian government contract for the project. Thales Alenia was expected to supply state-of-the-art avionics for the project. In April 2013, the Izvestiya daily reported that EADS Astrium and Israel Aerospace Industry, IAI, had also competed for a role in the project. The newspaper quoted the head of NPO Lavochkin Viktor Khartov as saying that the goal of the program was to give the Russian industry a necessary experience to eventually switch to a domestic production of the most sophisticated spacecraft. As a result, key criteria for the selection of foreign subcontractor would include its willingness to transfer technology to Russia. According to Khartov, in the first phase of the Araks-R deployment will include a pair of satellites, to be joined later by three additional spacecraft. The system would be able to deliver "live" images at a resolution of less than one meter. NPO Lavochkin planned to complete the preliminary design of the system during 2013 and submit for approval by the Russian Ministry of Defense. 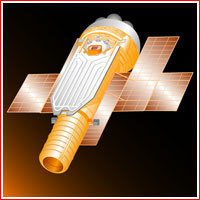 1977: NPO Lavochkin in Moscow proposes a spy satellite capable of transmitting digital images from orbit. 1979: TsSKB Progress in Kuibyshev (now Samara) proposes a spy satellite capable of transmitting digital images from orbit. 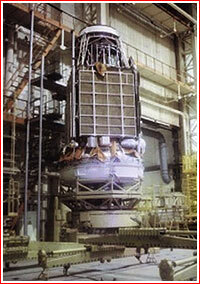 1983 June: The Soviet government authorizes the development of Araks-N and Sapfir-V satellites at NPO Lavochkin and TsSKB Progress respectively, with launches in 1986 and 1987. 1997 June 6: Araks-N No. 1 lifts off. 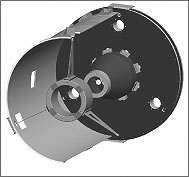 2000: TsSKB Progress wins a tender for the development of the Persona next-generation imaging satellite based on available 17V321 telescopes for three Sapfir satellites. 2002 July 25: Araks-N No. 2 lifts off. 2003 Aug. 10: Araks-N No. 2 fails in orbit. A Proton rocket launches an Araks satellite. A possible load-bearing structure of the optical system for the Araks satellite. Alim Velikozhon led the development of the optical system for the Araks satellite.